The Florida Baseball Ranch is currently accepting applications for 10-week paid summer internships. Assistance with organization and delivery of instruction on throwing. 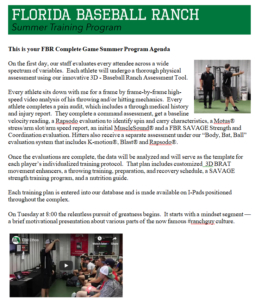 Assistance with organization and delivery of instruction on mobility/stability training. Assistance with physical therapy staff in set up/clean up for PT services as needed. Cleaning, maintenance, organization, and preparation of all equipment. General cleaning, preparation, and maintenance of the property and facility. Assistance with organization and delivery of instruction on hitting. For Throwing Ranch Hands, TBR or FBR experience is preferred (should have attended a camp, a precision strike or a summer/winter program at either ranch). Strength and Conditioning Ranch Hands should be an experienced CPT, CSCS or have or be pursuing a degree in exercise science or exercise physiology. Data Collection and Analysis Ranch Hand should have or be pursuing a degree in applied mathematics, business analytics, statistics, computer science or a related major. Applicant will be responsible for his/her own food, lodging and transportation and must be available for duty Monday thru Friday beginning on June 5th and continuing through August 11th. Complete the form below. Indicate the position you are applying for in the message section. Call us at 866-STRIKE3 (866-787-4533) if you would like more information (Ask for Amy).